Wonderful satire that is very funny, very touching and very thought provoking all at the same time. Simply put this is one of the real gems of the Tribeca Film Festival. Adam lives in Nazareth and is looking for a better way. His life is in turmoil, his father is dying, his wife is pregnant wants a new room for the baby and he wants to make enough money so he doesn't have to worry. As things transpire he hits upon the idea of selling bottled air from the Holy Land. A frequently laugh out loud film, this is more than just a comedy. 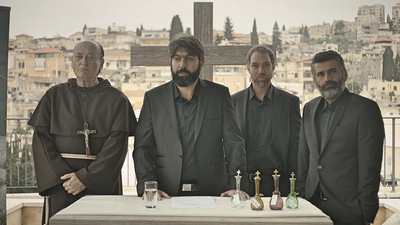 A pointed look at the tourist trap mentality of the Holy Land, the film also takes pot shots at the state of Israel, Arab Israeli relations as well as the relationships between the various religions. This is a film that will have you thinking as its making you laugh. I could go into the films technical aspects, its wonderful score, Its staging as series of single shot scenes and on and on, but I don't see the point since what you are going to remember is the laughter in crazy scenes like the traffic jam. Truthfully this is a near perfect film with only the endless honking horns over the end credits to count as a flaw. We are in full agreement with HOLY AIR. Excellent film! And your were inspired to write a wonderful review of it here as well. I loved the score too, and found myself laughing throughout.